I love my dining room set! I couldn’t be more happier. Exquisite contemporary styling is yours with the Uptown 5-Piece dining set by Simple Living. 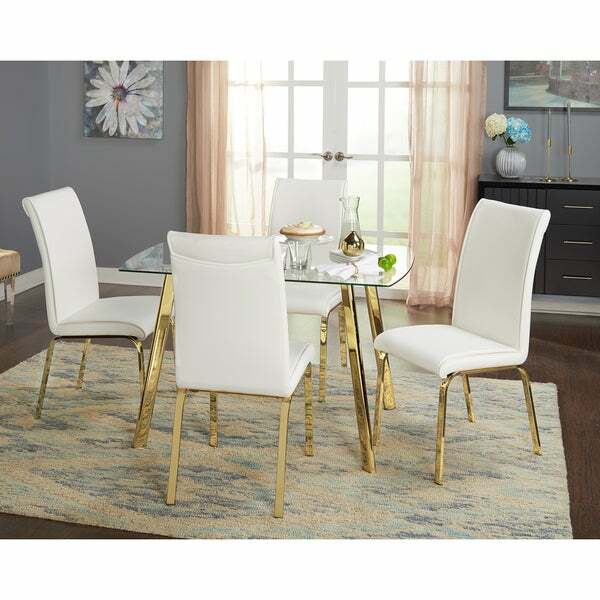 Update your dining space with this sleek set of four upholstered parsons chairs and a glass-top dining table. Each piece features metal legs finished in stunning gold for a look that's both eye-catching and on-trend. 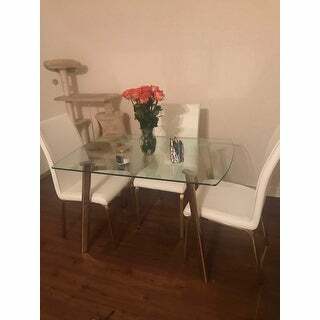 The table is topped with clear tempered glass, providing an ultra durable surface that's easy to clean. 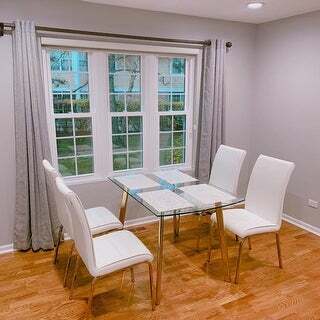 The table is sized perfectly for smaller dining areas or breakfast nooks. The parsons chairs are fully upholstered in a smooth, easy-care faux leather, available in black or white. This product will ship to you in four (4) boxes. I have the black and gold and it’s perfect for my breakfast nook. Plus I was able to catch it on sale so I’m extremely pleased. I’m not sure how long the seat cushions will hold up over time (I’ve only had it for a few weeks and I can already see creases in one of the chairs) but overall I’m very satisfied with my purchase. I love this table. Perfect if you live in an apartment. Items came very well packaged and was easy to put together. I’m petite 4’11 and 105 lbs and I put it together by myself. 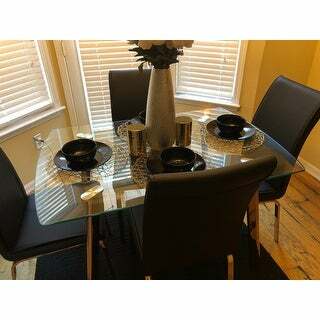 I just received my beautiful dining room set today.Absoultly georgious!! 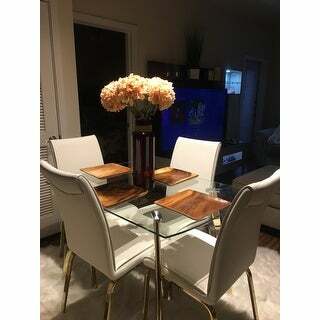 It matches the I Q Bold Champagne Mirrored end tables an coffee tables I purchased from Overstock for my living room.The whole dining room an Living room complement each other so nicely.I got the Black an have the white Safaieh Silken Glam Ivory plush carpet I purchased as well underneath it!! It's very well made an very easy to put together.Ive already gotten in one day so so many complements!! I would highly recommend this.I also just purchased different chairs that are orange with gold legs.Also from Overstock,,So this way I can change up the look every season .That's another thing I love about this set if ur like me an like to change up ur look every so often u can by getting different chairs.Ill put them(( spare set)) in my garage an then change them up when I need a new look.!! 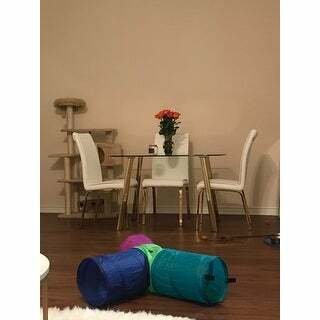 I can't wait for the Gold Peices I ordered for the placemats to come I also ordered from them.Theres so much u can do to have this set fit into any space or decor u decide on.. Happy Purchase.Love my OVERSTOCK!! Super fast shipping and this set is perfect for my apartment! I love the gold accent legs and classy look. The glass is solid. Excited to entertain on this piece! Very impressive set. First table top came damaged, but Overstock sent replacement right away and it came in perfect condition. Table top is very happy. It is a 2 people job to put it together. Gold parts are not coating, but tape-foil like covering. I hope it won’t scratch and peel off over time. Other than that - perfect for what I needed. Very comfortable chairs! 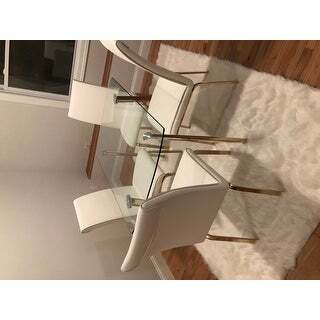 I love this dining set it’s super pretty and chic! Easy to to clean ( I have it in black) and it was easy for my dad to put together. Wow, I love this dining set. The package came on time. It was easy to assemble and once it was done, I was so happy about the way it turned out. I would highly recommend this set to anyone! 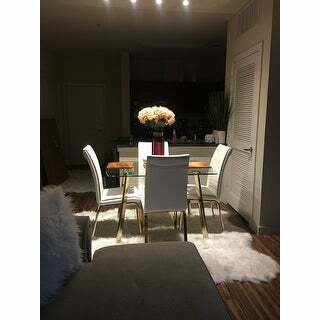 So pretty in person and perfect for my quaint dining area! Easy to assemble and very chic! Fast delivery just what I wanted would recommend whiter then I thought love it. Very hard to find item in my area over stock is great. Plan to buy more seats. "Is this table sold separately"
"How can I get notified when the white is back in stock? " Once all options are out of stock, you will be able to enter your email address to be notified when it is restocked. It matches my apartment decor perfect! 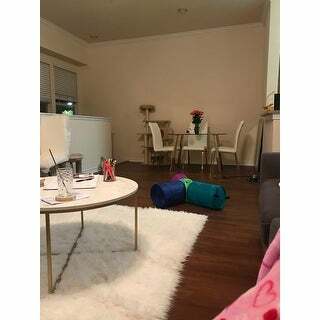 "What is the return policy if he table perhaps doesn’t fit well in my space? "